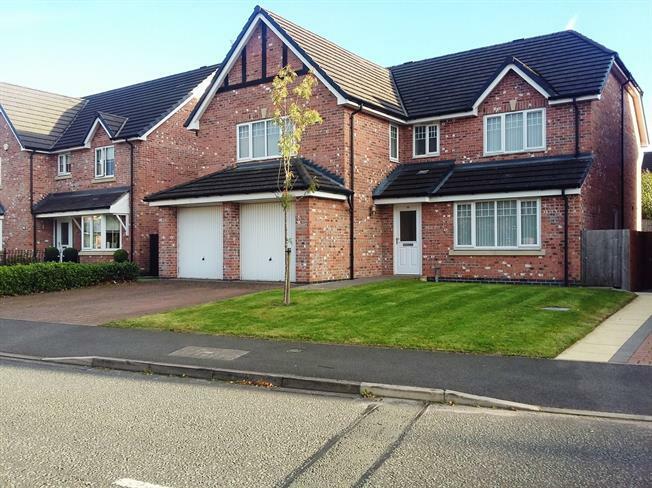 5 Bedroom Detached House For Sale in Macclesfield for Guide Price £590,000. This five bedroom detached home is rare in offering such large and spacious family accommodation comprising lounge, dining room, open plan kitchen living area, study and wc downstairs whilst upstairs are five double bedrooms, with the master and second benefitting from en-suites, and family bathroom. Externally to the front of the property is off road parking and lawned area with access to the integral double garage whilst to the rear the property benefits from a private and secure garden mostly laid to lawn. With high specification a viewing is strongly recommended. Composite front double glazed door. Radiator, laminate flooring, under stair storage, original coving, ceiling light. UPVC double glazed french double doors opening onto the garden. Double glazed uPVC window facing the rear. Radiator and electric fire, carpeted flooring, original coving, ceiling light. Double glazed uPVC window facing the front. Radiator, carpeted flooring, original coving, ceiling light. Radiator, laminate flooring, tiled splashbacks, spotlights. Concealed cistern WC, wall-mounted sink, extractor fan. UPVC double glazed french double doors opening onto the garden. Double glazed uPVC bay window facing the rear. Radiator, tiled flooring, ceiling light. Double glazed uPVC window facing the rear. Tiled flooring, tiled splashbacks, spotlights. Granite effect work surface, fitted wall and base units, stainless steel one and a half bowl sink with mixer tap and drainer, integrated electric double oven, integrated gas hob, over hob extractor, integrated dishwasher. UPVC double glazed side door. Radiator, tiled flooring, tiled splashbacks, ceiling light. Granite effect work surface, fitted base units, stainless steel sink with mixer tap and drainer, space for washing machine, space for dryer. Double glazed uPVC window facing the side. Radiator, carpeted flooring, original coving, ceiling light. Loft access . Carpeted flooring, built-in storage cupboard, original coving, ceiling light. Double bedroom; double aspect double glazed uPVC windows facing the front and side. Radiator, carpeted flooring, a built-in wardrobe, original coving, ceiling light. Double glazed uPVC window with frosted glass facing the side. Heated towel rail, tiled flooring, tiled walls, spotlights. Concealed cistern WC, double ended bath with mixer tap, single enclosure shower, wall-mounted sink with mixer tap, extractor fan and shaving point. Double bedroom; double glazed uPVC window facing the rear. Radiator, carpeted flooring, a built-in wardrobe, ceiling light. Double glazed uPVC window with frosted glass facing the side. Heated towel rail, laminate flooring, part tiled walls, spotlights. Concealed cistern WC, double enclosure shower, pedestal sink, extractor fan and shaving point. Single bedroom; double glazed uPVC window facing the rear. Radiator, carpeted flooring, ceiling light. Double glazed uPVC window with frosted glass facing the front. Radiator, laminate flooring, part tiled walls, spotlights. Concealed cistern WC, panelled bath with mixer tap, shower over bath, wall-mounted sink with mixer tap, extractor fan and shaving point.